If you live in Western Pennsylvania, you most likely know Attorney Edgar Snyder's face from television commercials or billboards, pointing his finger and saying, "There's never a fee, unless we get money for you!" But what you probably don't know is how he became the most recognizable injury lawyer in the region. Attorney Snyder's father, a Russian immigrant, and his mother, a Pittsburgh native, stressed the importance of hard work and a good education. They gave him and his siblings two options for their future employment, asking, "Are you going to be a doctor or a lawyer?" Because of his knack for winning arguments and his success on his college debate team, Attorney Snyder felt the legal profession was a good fit for him. After graduating from Pennsylvania State University, he enrolled in the University of Pittsburgh School of Law. After graduating from law school, Attorney Snyder opened his own storefront office in Duquesne, PA, setting up shop across the street from the steel mill so the workers would see his light on after their shifts. At the time he was also serving as an Allegheny County assistant public defender and rose quickly among the ranks of criminal defense attorneys. He represented several high-profile clients, including Stanley Hoss, in what many consider to be Western Pennsylvania's trial of the century. Despite his success, Attorney Snyder's passion was helping injury victims and people with disabilities. Through his storefront operation he got to know many of these clients well, and Attorney Snyder was determined to expand his personal injury practice. I became a lawyer because I grew up in a family where my father was a first generation and he had a fifth-grade education and came over from Russia. And in our family growing up, the statement that was given to my brother and my sister and myself was, "You are going to be a professional. Do you want to be a doctor or do you want to become a lawyer?" That's what was said. I went to Penn State and first semester I got a C in chemistry, which eliminated my medical career. And therefore, my father said, "You only have one choice. You've got to become a lawyer." I worked for my brother-in-law who had a law firm in town, and he paid me the $100 a week that I was able to get as a salary—which is true, $5,000. And I opened up my own office immediately upon graduating in Duquesne, Pennsylvania. I opened up a store front office right outside of the steel mill. In the 40 years that I have practiced law, I have never had a boring day. I've had some miserable days, but they weren't boring. In 1982, Attorney Snyder discovered the power of advertising. Soon, Attorney Snyder's television ads about a free legal consultation were making him a household name across the region. As Attorney Snyder's reputation as a caring but tough injury attorney grew, so did the law firm. 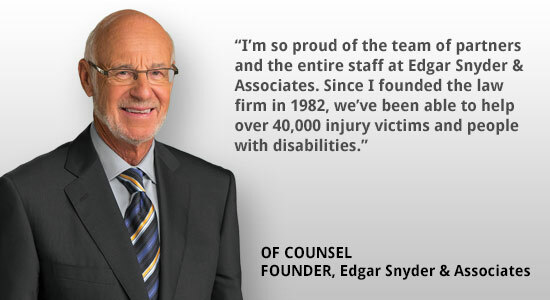 Today, Edgar Snyder & Associates has five offices across Western Pennsylvania and is recognized as a top-rated personal injury law firm. Attorney Snyder says, "I believe that if you are fortunate enough to be successful in business, you have a responsibility to give back to the community." The law firm represents many victims of alcohol-related accidents and sees firsthand the devastation they can cause. Attorney Snyder airs public service announcements on TV, radio, billboards, and the Web to help prevent drunk driving. The firm also sponsors a variety of community outreach efforts that spread the "Safe & Sober" message. Attorney Snyder has received numerous awards honoring his philanthropic efforts in the local and international community. He has received PNC's Community Builders Award and the Emanuel Spector Memorial Award, which recognizes exemplary service to the community. In addition, he was named a Distinguished Alumni by the University of Pittsburgh School of Law. Attorney Snyder also travels for various speaking engagements, such as the Teen Driving Safety Summit and the Edgar Snyder Save A Life Tour, among others. Attorney Snyder received the Trib Total Media Readers' Choice Award for Best Attorney in the City from 2010-2016. He was selected to the Pennsylvania Super Lawyers list, an honor awarded to the top five percent of state-wide lawyers. Attorney Snyder has an AV® Preeminent™ rating from Martindale-Hubbell, the highest possible rating for ethics and ability from this international authority on the legal profession. He is a 2012 Penn State Alumni fellow, a lifelong title given in recognition of outstanding professional accomplishments. The award is the highest honor given by the Penn State Alumni Association. Attorney Snyder received a 2013 Diamond Award from the Pittsburgh Business Times. The Diamond Award recognizes accomplished business leaders in the Pittsburgh area. He received a 225th Anniversary Medallion from the University of Pittsburgh. Medallions recognize Alums who have made outstanding contributions to their professional fields and who continue to contribute to the success of the University and its students. Attorney Snyder is a member of the Allegheny County Bar Association, Pennsylvania Bar Association, Pennsylvania Association for Justice, and American Association for Justice. He is a President's Club Member of the Western Pennsylvania Trial Lawyers Association. Learn more about Attorney Snyder's accomplishments by viewing his LinkedIn or Google+ profile. Attorney Snyder graduated from Taylor Allderdice High School (Pittsburgh, Pa.) in 1959. After high school, Attorney Snyder earned his Bachelor of Arts Degree from Pennsylvania State University and earned his Juris Doctor degree from the University of Pittsburgh School of Law. He is licensed to practice law in all Pennsylvania State and Federal Courts. "No Fee TV" -- Is a "Free Legal Consultation" Really Free? Behind the Scenes of "No Fee TV"
"Ipso Facto", Pittsburgh Post-Gazette -- Attorney Snyder discusses what it's like to be a local celebrity and how he sees the future of the law firm. Pittsburgh Quarterly -- Attorney Snyder talks about his life and his career.